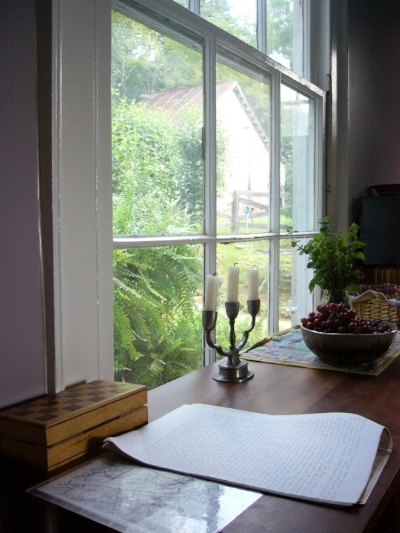 Porches Writing Retreat offers five private rooms. On the second floor, the Blue Queen Room and the Dove Room are spacious and light, lovingly restored. Each room offers elegant comfort, with original heart-pine floors, hand-blown glass windows, and high-ceilings. A queen size bed, antique armoire, writing desk, and comfortable desk chair, as well as reading chair and sofa. The wide upstairs porch runs the length of the house and overlooks the James River bottoms and distant bluffs. The Garden Room on the second floor overlooks the old maple grove and an ancient marble rock formation (mentioned in the 1875 memoir of the house). This room provides writing desk, double bed, and large comfortable reading chair in a light-filled room with soft carpet and beautiful paintings. Second floor rooms share a hall bathroom with a claw-foot tub and shower. Enjoy both upstairs and downstairs porches. The Jade Room and Treetops on the third floor have lofty views as well as lovely light. The third floor rooms share a newly renovated hall bathroom with shower. All the porches are accessed through the central hall. So all rooms may enjoy both upstairs and downstairs porches. Every room has ceiling fans, desk fans, and air-conditioning. Linens provided. Tissues, toilet paper, paper towels. Laundry facilities are on the premises. Good drinking water from Artesian well. A large well-equipped communal kitchen is available for writers to prepare their own meals whenever they like. (Complimentary tea, sugar, and basic staples). A grocery store is in the town of Lovingston, a 20-minute drive from the retreat, where you may purchase supplies before arrival at Porches. There are elegant and comfortable common rooms. The writers refectory (dining room) provides refrigerators, microwave, Keurig, Coffee makers and filters, mugs, glasses, dishes/flatware, cooking utensils. You may enjoy taking your meals inside or out on the porches or grounds. TV and DVD in living room library. Receipts for "professional development" are available. Discount rates may be negotiated for groups or residencies over a month.